February 1, 2011 Dan O. In a nut shell, William Hurt is a playa fo-sho. An author of travel guides (William Hurt) must come to terms with the tragic murder of his young son and his estranged wife (Kathleen Turner). But things begin to look up when he meets a lovely, kooky dog trainer (Geena Davis) who definitely marches to the beat of her own drum. After viewing the trailer for this film, I was expecting a bit of a romantic comedy, with pure 80’s cheesiness. 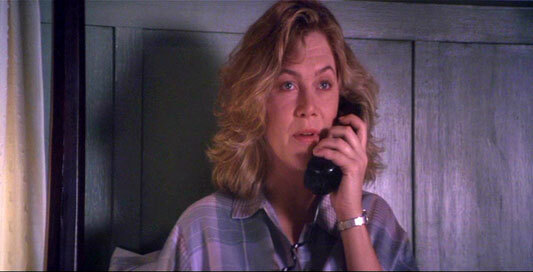 However, what I got was not cheesy, and not so much as a romantic comedy, as much as it was a romantic drama. The screenplay written by director Lawrence Kasdan is great. You have a lot of quirks in this film, as well as a lot of real, harrowing stuff as well. The film touches so well on the idea of love, and how it can be rejuvenated with that one person who is just so special. There isn’t a whole bunch of drama with this film, as there is some little points of humor within the screenplay and it all works so well. These characters are human, and they have human emotions and they are all pointed out so well within this screenplay. However, there were parts in this film that were very, very slow. You may feel at times that you are just annoyed with the pace, because you feel as if nothing is going to happen, and usually nothing does happen. Way too many scenes of Hurt just walking around moping, or messing around with his dog, that all just seemed useless really. 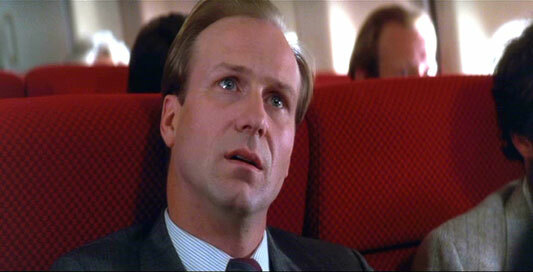 William Hurt gives a very subtle performance as Macon. There were moments in this film where I didn’t know if I really liked him or not, cause his character was so unpleasant, but as things started to move on, I saw a transformation in Macon and I started liking him. Kathleen Turner is good here as Macon’s wife, Sarah, and brings a lot to the table even though her character isn’t here much. 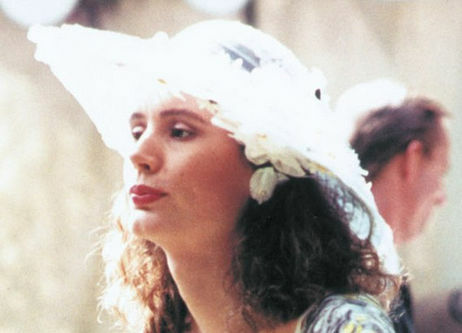 The best of the cast is Geena Davis who really does shine here as Muriel. She brings a lot of humor to the film as well as quirkiness, that has us automatically fall in love with her character. She definitely deserved that Oscar she won, and I wish she had more roles in today’s world. 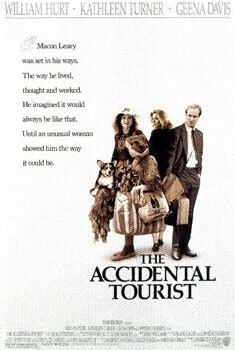 Consensus: Though slow and dull at times, The Accidental Tourist works as a drama about finding love with a very good screenplay, as well as great performances from the cast, mainly Davis. Great review Dan. I like Kasdan as a writer, he has a skill of creating good character pieces that have a point but also tell a good story. His problem is inconsistency and an argument that he’s a better writer than he is a director. His recent output hasn’t been great. He’s a great writer, but his direction isn’t one of the best thing he does, and it kind of suffers because of that. And his last one sucked, I forgot what it was.